What’s more depressing than the fact that it took Hollywood half a century to make a major motion picture about Dr. Martin Luther King Jr.? How about that the film that finally has been made about him is being released into a new America that looks not so radically different from the old America it depicts? Long before the end credits, when a song by Common and John Legend makes explicit the contemporary parallels, Selma bears the burden of current events—which is to say, it’s impossible to look at images of white lawmen coming down hard on unarmed black civilians and to think only of yesterday’s struggles. The topicality would be an awful accident if what happened in Ferguson and Sanford weren’t symptomatic of a bigger problem in this country, one that didn’t end with the life of the civil rights movement’s most prominent leader. As cinema, Selma is commendable; as cultural barometer, it’s beyond reproach. 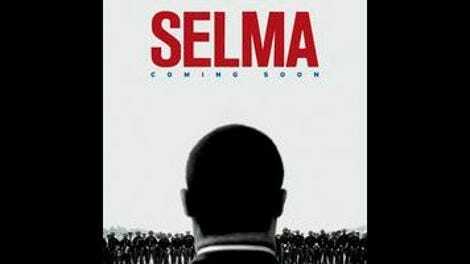 But about the film as cinema: Less an MLK biopic than a kind of procedural on the man’s grassroots methods, Selma benefits from seizing on a very specific historical moment. 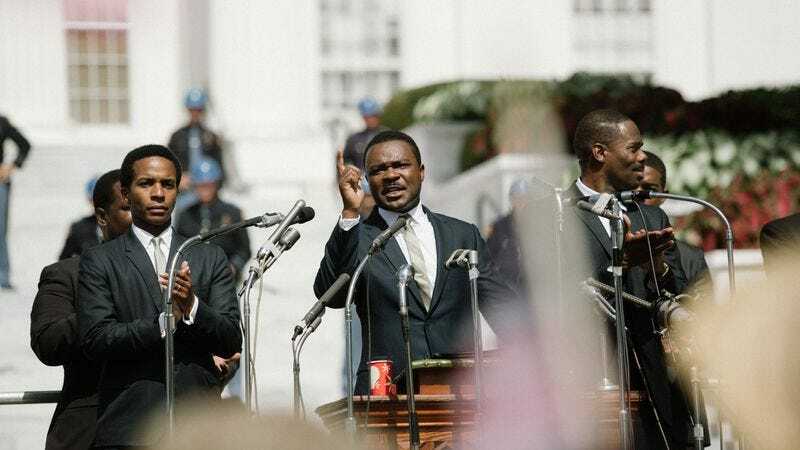 Instead of offering a summation of their subject’s life and legacy, director Ava DuVernay and writer Paul Webb plunk us down in the early weeks of 1965, after the march on Washington and “I Have A Dream.” By this time, King (David Oyelowo) is already a figure of great visibility and influence, one who understands that his presence brings with it the eyes of the world. Per its title, the film concerns King’s arrival in Selma, Alabama, where he mobilizes the Southern Christian Leadership Conference (SCLC) to assist in the voting rights movement already in progress. “It can’t wait,” he tells Lyndon B. Johnson (Tom Wilkinson) when the president asks him to sit on the issue; as King reasons, the safety of black citizens in the South is directly related to their ability to vote racist white politicians out of office. At its most interesting, Selma gets into the nitty-gritty of organized action, making audiences privy to sometimes heated backroom discussions. Dr. King’s reputation as a virtuous, effective leader is so secure today that it’s bracing to see his ideas challenged on screen—by a young John Lewis (Stephan James), whose Student Nonviolent Coordinating Committee fought for voter rights years before SCLC arrived in Selma, and by Malcolm X (Nigel Thatch), weeks before he was assassinated. What emerges at center is a vision of King as a savvy strategist, not a noble saint; there’s a fascinating tension between his nonviolent tactics, informed by his faith, and his understanding that violence, when perpetrated by the other side and caught on camera, can be a powerful motivator. Carrying around a few extra pounds and sporting some iconic facial hair, Oyelowo toes the line between embodiment and impression. The opening scene slyly foregrounds the duality of the role: Dr. King delivers some passionate words straight into the camera, then “breaks character” to complain about his attire; he is rehearsing an upcoming speech. Selma sees its subject as an ordinary, level-headed man entrusted with the responsibility to make himself extraordinary, as part of the “performance” of leadership. But Oyelowo nails only half of that equation. The lack of licensed King speeches is a blessing in disguise; in the few moments that he does take the stage, the actor can’t quite match the oratorical fervor of the famous leader he’s playing, perhaps because real footage of his fiery addresses is so readily available. Oyelowo fares better when illuminating the less public side of King, as in the wrenching scene when his wife, Coretta Scott (Carmen Ejogo), confronts him about his infidelities. In general, Selma is much stronger when staying off the pulpit. Two-person conversations occasionally stray into speechifying, which is one of a few ways that the film adheres to the conventions of the common prestige picture. DuVernay is terrific with her actors, and smartly enlisted the services of cinematographer Bradford Young (Pariah, Ain’t Them Bodies Saints), who gives the material a handsome sheen without making it look too museum-exhibit slick. Too often, however, do the director’s visual choices shade into bombast; her use of dramatic slow-motion for scenes of violence—most notably during the film’s “Bloody Sunday” sequence—dampens the sickening power of that imagery. Wouldn’t it be better to stage such material starkly, to allow the audience to see it as America did on its television sets? Though an inferior film in most other respects, Lee Daniels’ The Butler handled the horrors of the 1960s South more effectively—namely, by staring the hate and ugliness right in the face. Nothing if not ambitious, Selma attempts to nest a small-scale character study into a larger survey of King’s efforts in Alabama and at the White House. The balancing act isn’t always successful: By the end, as the marches have begun in earnest, Oyelowo starts to be swallowed up by the iconography of the events, the film running out of room for nuances of character. But Selma never quite goes hagiographic, nor does it lose its sense of urgency. Avoiding flashbacks to her subject’s younger years, and resisting the urge to cut ahead to his tragic death, DuVernay sticks to her three-month timeline. This creates a present tense that most biographical period pieces lack—and by depicting neither the beginning nor the abrupt end of King’s crusade, the film implies that his dream for the country remains a work in progress. Put another way: The fight for black lives in America goes on, with Dr. King still there in spirit on the frontlines.